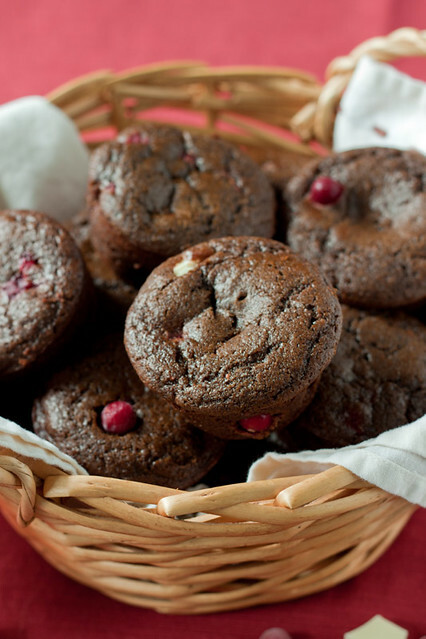 I went looking for cranberry muffins and found a recipe that looked good, but it didn’t fill my chocolate or gingerbread cravings. Eventually it dawned on me that I don’t need a recipe, I can just add cranberries and chocolate to my already awesome gingerbread muffins! I added some cocoa and melted bittersweet chocolate to the muffin batter and at the last minute decided to throw in white chocolate chunks with the cranberries. The combination worked out better than I had hoped. The gingerbread still tastes like gingerbread, and it’s just as moist and delicious as it always has been, but the chocolate gives it more depth of flavor. It’s almost an aftertaste–you taste the gingerbread flavor first and then a hint of chocolate pops up after it. I probably could have added more chocolate to the recipe, but I really like the subtlety of it. It’s even better when you get a bite of cranberry because the burst of tartness is a perfect contrast to the gingerbread and chocolate. White chocolate and cranberries already go great together and I think it works well in the gingerbread, too. If anything is dispensable, though, it’s the white chocolate. Feel free to leave it out if white chocolate isn’t your thing or if you think there’s already enough going on in the muffins. 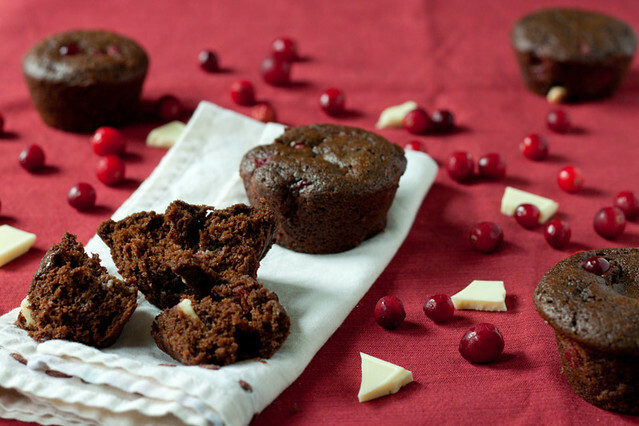 These muffins are really easy to make and filled with flavors that are perfectly suited for the upcoming holidays. 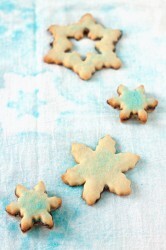 They are festive and pretty and very tasty, so they’d be great for gifts or holiday parties! I still had a ton of cranberries to use up, so I wound up making that other cranberry muffin recipe, too. It’s really different from this one, but the muffins were just as good. I’ve decided it’s Cranberry Week here on Back to the Cutting Board, so watch out for those in a few days! * I used 1 1/4 cup AP flour and 1 cup white whole wheat flour. Regular whole wheat flour should work fine, too. Either way, sift whole wheat flour to make it a bit finer or you could use whole wheat pastry flour instead. ** If you don’t have buttermilk (I almost never do), just add 1 tbsp. of white vinegar to a cup of regular milk and let sit out for about 10 minutes. *** I just chop the very large ones because I like biting into whole cranberries. 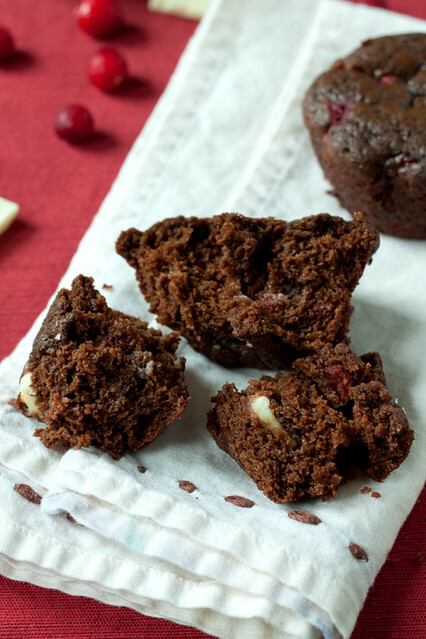 *Note: I usually don’t bother with liners, but I would recommend them here because even in very well greased muffin tins, if there are any chocolate or cranberries on the bottom/sides of the muffin, it will stick to the pan. In a small sauce pan, melt butter and semi/bittersweet chocolate over low heat. Alternately, you can melt in the microwave in 30 second bursts. Remove from heat and let cool slightly. Combine brown sugar, flour, cocoa, soda, salt and spices in a bowl. In a separate bowl, mix the egg, molasses, and milk. Stir in the melted chocolate. Add the wet ingredients to the dry and stir until just blended. Carefully fold in the cranberries and white chocolate. Fill each muffin cup about 2/3 – 3/4 full. DO NOT overfill because larger muffins will fall apart more easily. An ice cream scoop works really well for this. Bake for 15-20 minutes or until a toothpick comes out clean. Cool in pan for a few minutes and then transfer each muffin to a wire rack to finish cooling. Its “that day of the week” for me too….so these are calling my name! thanks for sharing your recipe! 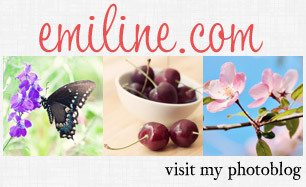 I am always looking for new recipes, to bake, eat and writte in my blog. Your recipe looks great, I love chocolate and berries,…perfect combination. barcelona cupcakes blog recently posted…Merry Christmas!